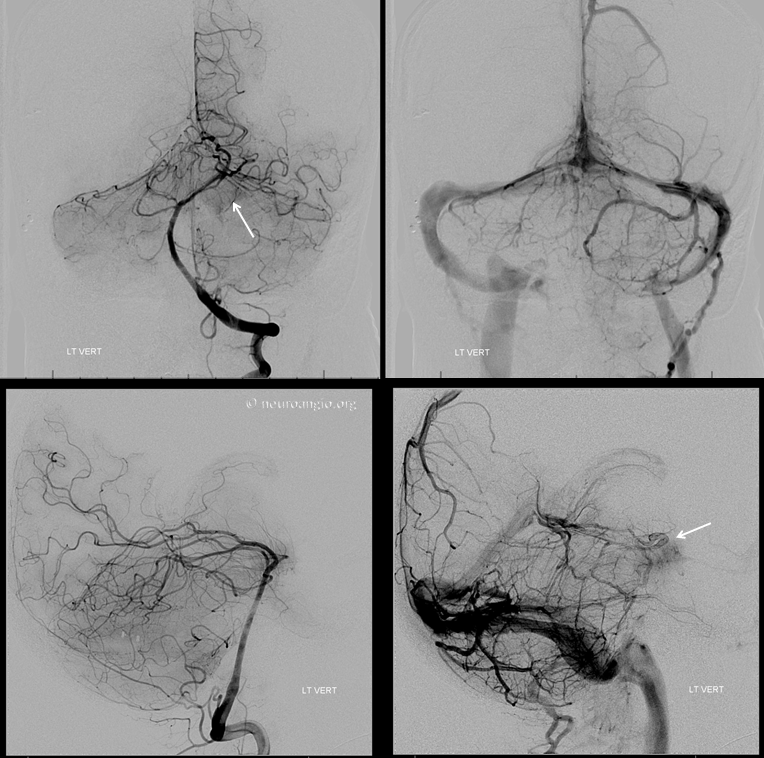 The value of preoperative meningioma embolization is difficult to demonstrate for those who lack the benefit of having seen, in training or practice of others, what an efficient embolization is capable of. Many believe that it is ultimately unnecessary, which may be the case for many tumors. 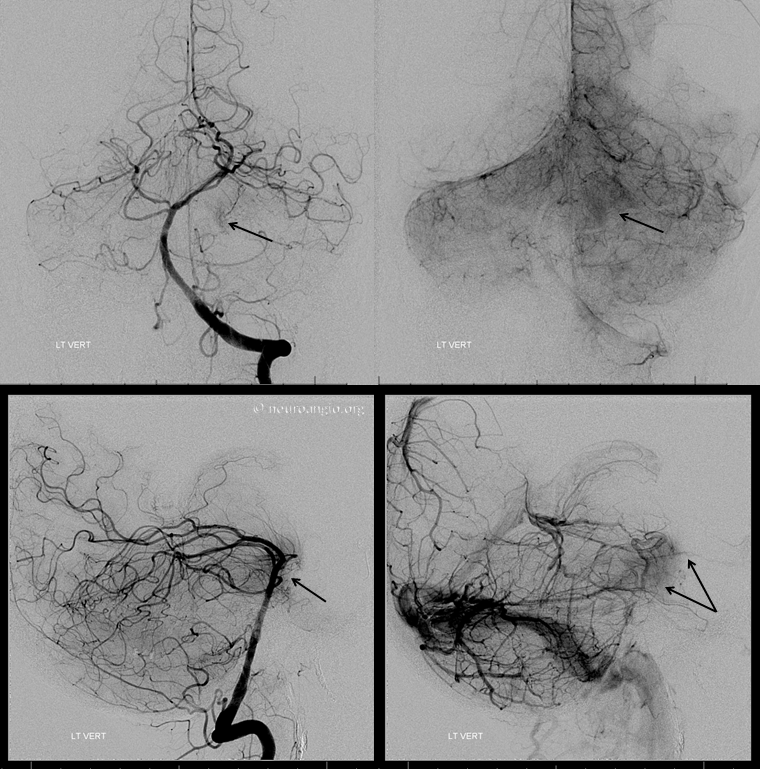 Therefore, when time comes to attack some kind of skull base monster, there is a certain lack of appreciation for how a preoperative angiogram and embolization can add game-changing value. 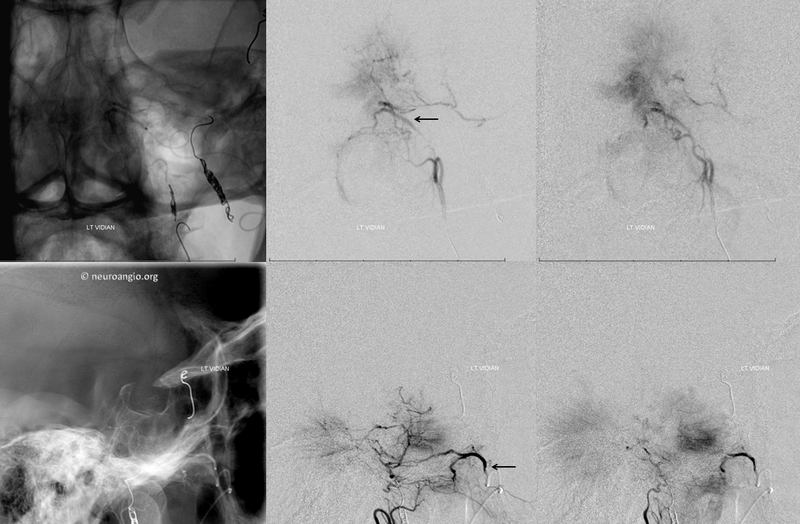 For this to work, both surgical and embolization efforts must be coordinated towards a shared goal. The ultimate purpose is not just to control blood flow, but to minimize the overall morbidity and maximize efficiency of treatment. 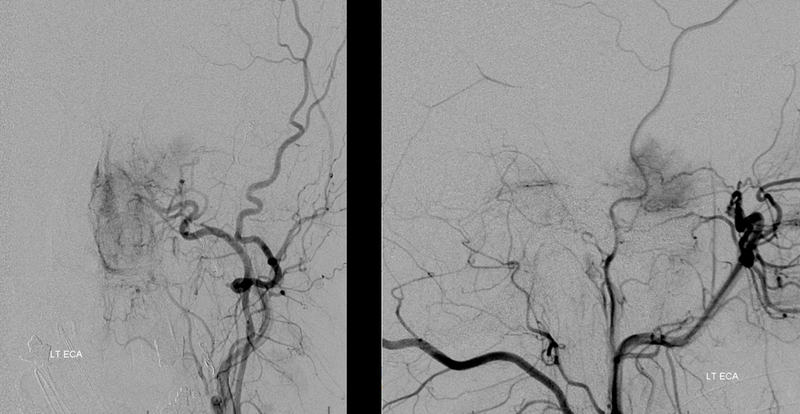 Thus, an overly conservative or inefficient embolization is a low risk, but ultimately unhelpful procedure. 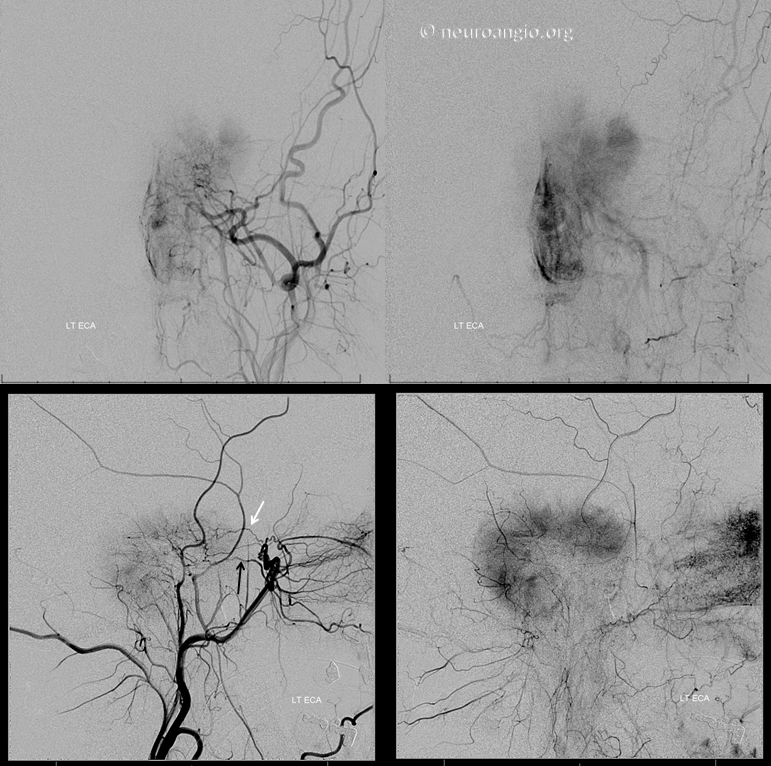 A thoughtfully aggressive embolization may be more hazardous, but pays serous dividends later. 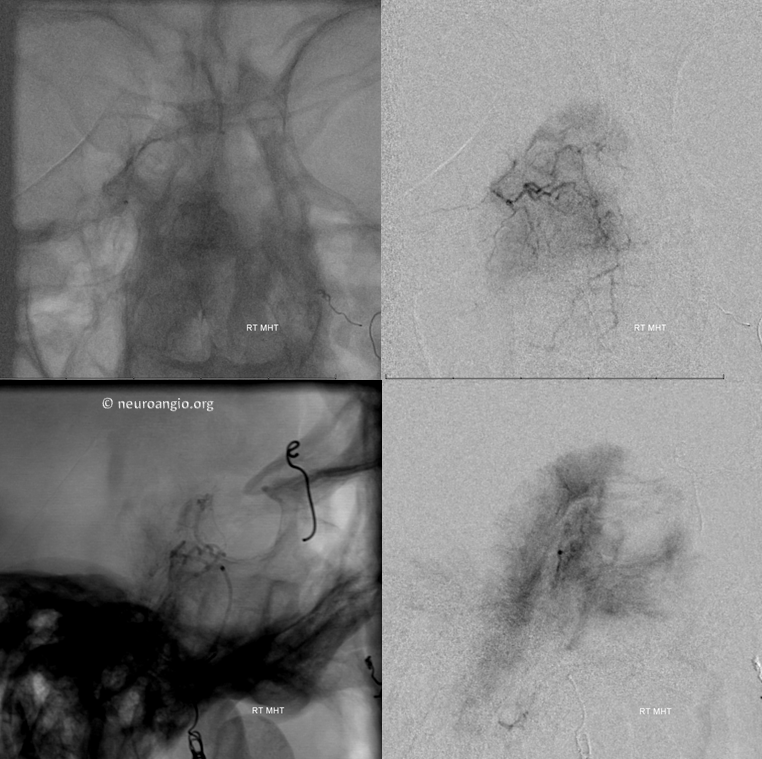 Thus, the embolization and resection should be viewed by both the patient and physicians as a package. 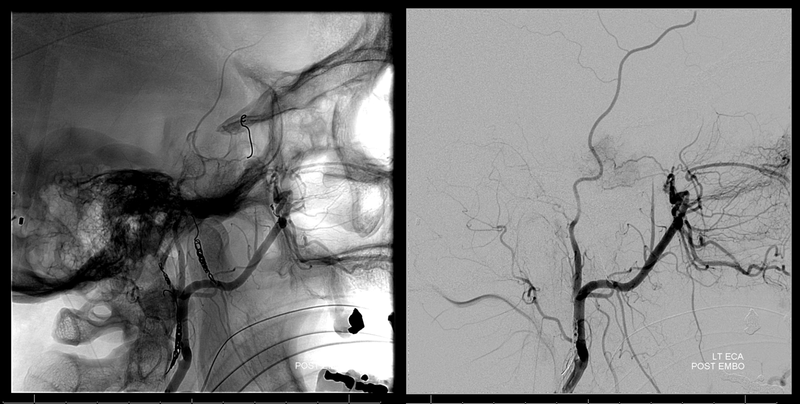 Left vert injection shows pial / dural supply from the distal basilar artery. The middle meningeal contribution is too small and tortuous for access with a catheter that would allow particle delivery. 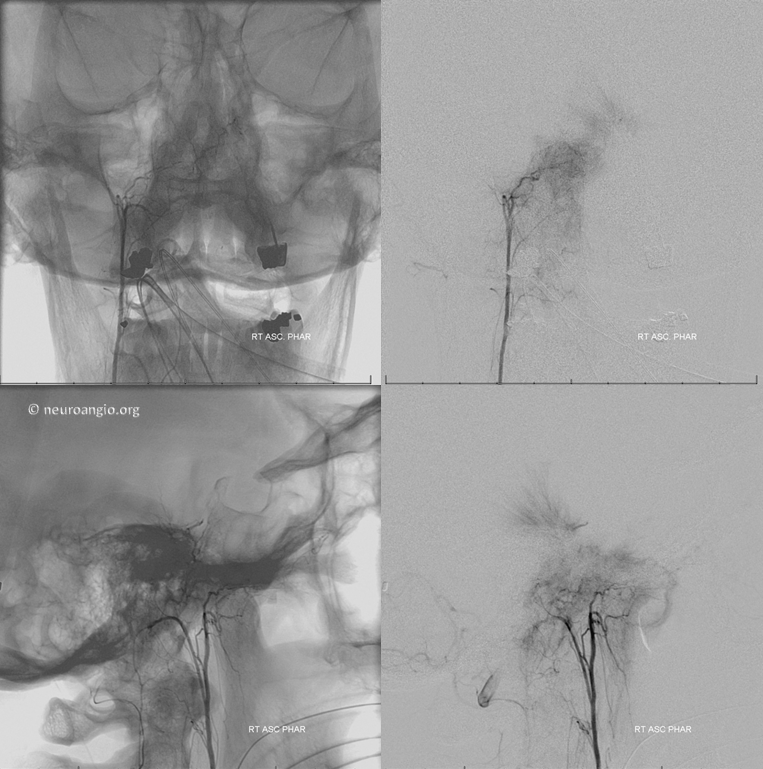 Therefore, the distal MMA is closed with a pushable fibercoil, and MMA embolized from a position proximal to meningioma feeder with small PVA Contour particles. 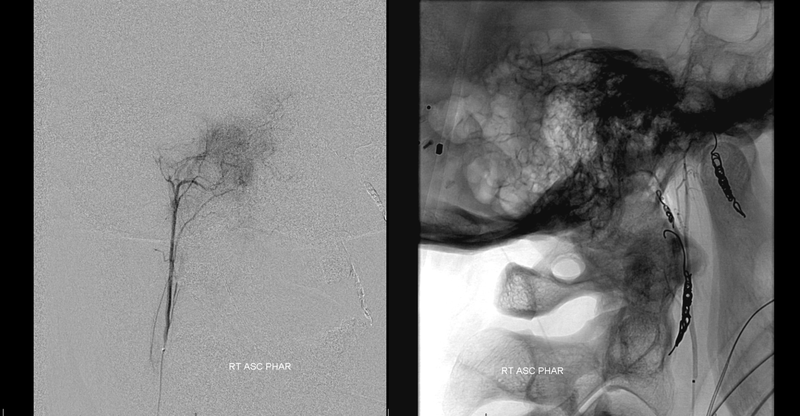 Post-embolization image shows peristent rotundum supply, which was not catheterized because of its size and tortuosity, although it is just as possible to carefully particalize it as the vidian or ascending pharyngeal. Attention turns to right ascending pharyngeal — as you can see, patience and persistence are key. A good embo is a very long embo, taking down as many feeders as necessary with as small particles as safely possible. Attention to radiation dose and ALARA techniques must be instituted and maintained throughout the procedure. Last but not least is the MHT. Why last — because sometimes it is possible, using wedge technique or other methods, to particalize a territory of one feeder from a catheter position in another, thereby obviating the need to catheterize something like MHT or ILT. And so, after doing everything else, a right ICA run shows the MHT contribution to be alive and well. It is important not to be overly dogmatic about anything in neurointerventional practice. For example, it is not helpful to say that it is never a good idea to particalize the MHT in a meningioma case. Certainly, it should not be done without thoughtful consideration of risks and benefits. In this case, the extent of MHT contribution is so large that, should it stay open, the overall value of embolization will be markedly diminished — the MHT will perfuse, albeit partially, much of the territory that used to be supplied by other feeders, now closed. 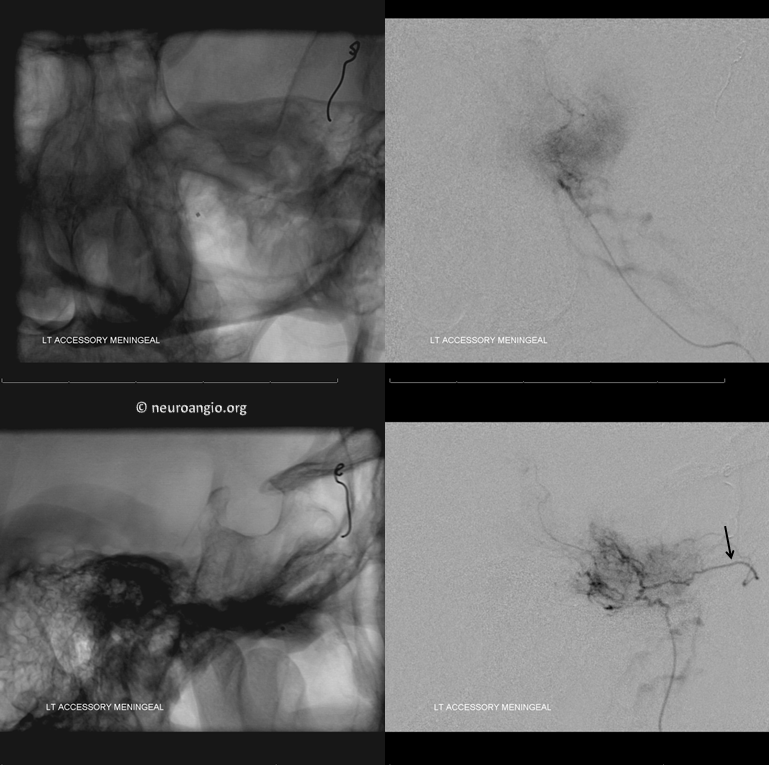 In my experience, the incidence of cranial nerve damage with Contour irregularly-shaped particles is less than with either spherically-shaped Embospheres or liquid embolics (this only applies to tumor embolization). 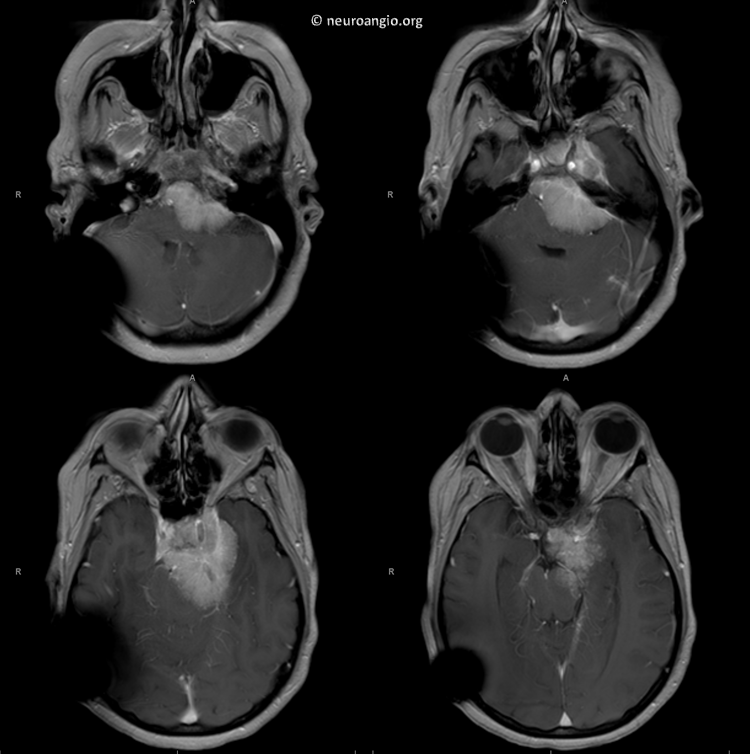 This is only an opinion based on personal observations; I would not use either Onyx or n-BCA to embolize the MHT, or another cranial nerve-related vessel in a patient with meningioma (dural fistula is another story, see case here). Also, I feel that in case of the MHT, the dangerous territory (carotids) are relatively easy to spot. One can even argue that it may be harder to spot dangerous anastomoses from positions that are felt to be more favorable, such as between the middle meningeal and ophthalmic, or ascending pharyngeal and vertebral arteries. In this case, the enlarged caliber of the MHT allowed for a relatively straightforward catheterization with an SL-10 catheter, which can be comfortably used to deliver particles up to 350 micrometers in size. The MHT contribution shown below justifies the effort. Notice how wedge position allows for visualization of territories not originally seen from the ICA injection (inferior, tail portion of the tumor which belongs to the ascending pharyngeal) Notice also, in the frontal view, how the tumor blush is more prominent superiorly, while inferiorly the vessels are devoid of adjacent tumor blush, as the parenchyma of the tumor in that location has already been embolized from the ascending pharyngeal positions, leaving only the leafless trunks of the larger feeders. A DSA injection is made midway through the embolization to check for reflux. 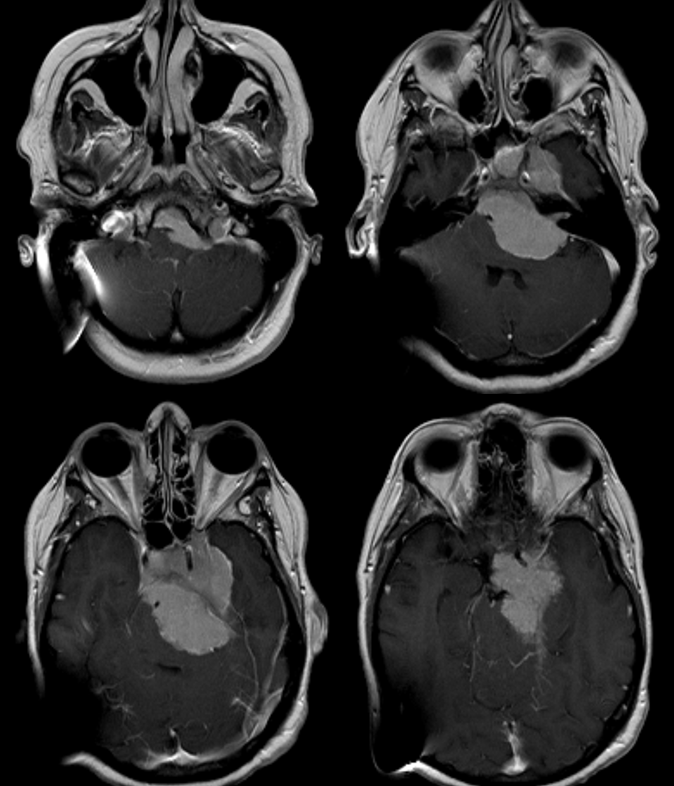 Notice shrinking tumor blush, and contrast opacification of the contralateral MHT/ILT networks in the frontal view. The injection was not strong enough to visualize the left ICA, for fear of loosing catheter position. Appreciate the beautifully symmetric nature of the bilateral MHT network. Final left vertebral image shows how the unembolized upper basilar contribution now perfuses a lager part of the tumor, as evidenced by the larger tumor blush compared with the initial vertebral injection. This is another reason to have gone after the MHT, to minimize the deleterious effects of residual basilar and rotundum feeders. 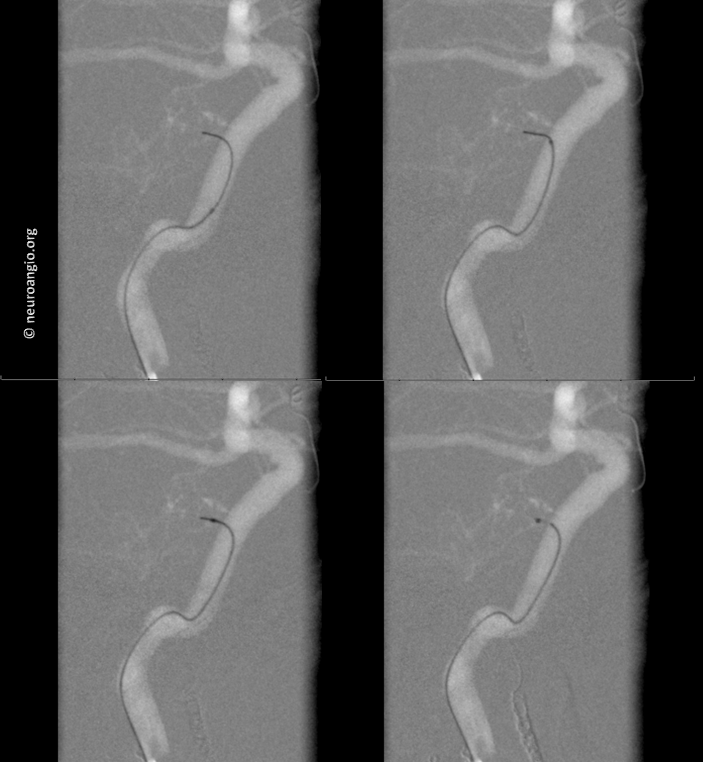 The overall result is a very acceptable and functionally helpful embolization.